I've been making my Aeropress by eye for ages, but have upped my game this year. In January I got a hand grinder for work, and this week, for $11, I finally bought a scale for more accuracy. I brew at the same ratio that my local favorite shop does, 16:1. 18g in and 288g out. The next step might be a scale for my espresso brewing, but getting a quick response, water resistant scale, is a more costly investment - like, at least $100 for a Brewista, but the "industry standard" Acaia is $200. I brew with a chemex. When i switched to a scale I really began enjoying a consistent cup each morning. I wish I could have started with a scale years ago. Indeed! I finally even bought a scale for my espresso. The Brewista II was on sale for $69.99 just after Christmas! I pick up a cheap Salter scale from Amazon for espresso, they cost me about $20 and they last several years. It isn't water resistant, but the price makes up for it. I've had my eye on the Acaia but it's hard to justify $200 for a scale. I too use a relatively inexpensive digital kitchen scale. It's a Sunbeam, but it's produced under the Salter name now and sells for about $20-25. I bought mine in 2005 and have used it nearly daily for these 13 years without a hiccup. I just change the 9V battery every few years. It measures in grams and tenths of ounces and has a taring function that makes it super easy to use. I use it for coffee, baking, postage, and anything else around the house I need to weigh up to a couple pounds. I'm not sure what I would do with a $200 scale. (02-02-2018, 04:47 AM)BrickHud Wrote: I too use a relatively inexpensive digital kitchen scale. It's a Sunbeam, but it's produced under the Salter name now and sells for about $20-25. I bought mine in 2005 and have used it nearly daily for these 13 years without a hiccup. I just change the 9V battery every few years. It measures in grams and tenths of ounces and has a taring function that makes it super easy to use. I use it for coffee, baking, postage, and anything else around the house I need to weigh up to a couple pounds. I'm not sure what I would do with a $200 scale. I'm not trying to sell you, but the $200 one is an 0.1g accuracy (not 1g), rechargeable, water resistant (very important for espresso), can be recalibrated, and has bluetooth to talk to smartphone coffee-based app. My $70 Brewista hits most of those (except the calibration and bluetooth). The one pictured, not the Brewista, was $11. A hand grinder for work!!! Nice!! I hand grind at home but take ground coffee to work. I do not use a scale, preferring to eyeball it. I am okay with variations in my orning cup. Out of curiosity, what is your local coffee shop of choice? Bergies ? (03-08-2018, 08:26 AM)Gabe Wrote: A hand grinder for work!!! Nice!! I visit Peixoto most weekends. The baristas are all very friendly and make great coffee (especially the pourover bar), and I enjoy the ambiance. But I don't usually buy coffee from them for home, I like to have an excuse to visit. I ordered from Bergie's once and thought it was good. (08-01-2017, 01:17 PM)Gig103 Wrote: I've been making my Aeropress by eye for ages, but have upped my game this year. In January I got a hand grinder for work, and this week, for $11, I finally bought a scale for more accuracy. I brew at the same ratio that my local favorite shop does, 16:1. 18g in and 288g out. What hand grinder is pictured and how do you like it. (03-12-2018, 08:15 PM)SCOV Wrote: What hand grinder is pictured and how do you like it. It's called The Handground, and I like it. To me the selling point was the ergonomics. I much prefer the way this handle's vertical movement over the more typical horizontal, lid-mounted handles. The glass grounds catch bin is a nice touch too. 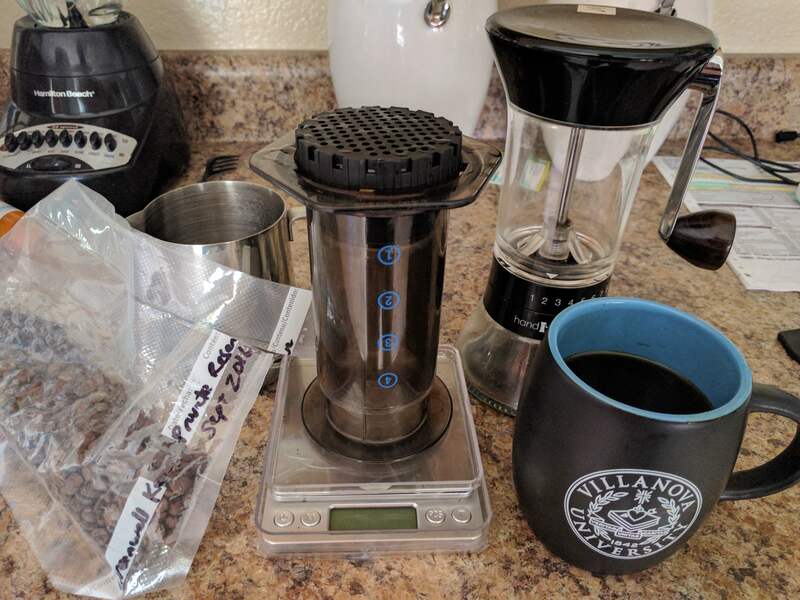 For the money, I'm pretty sure you can get a far more consistent grinder, though, and the steps are pretty big - there are 16 half-steps and by the mid point it's already French Press coarseness but with a lot of fines mixed in. But because, as I said, I picked it for Ergonomics, I'm satisfied. It helps probably that I use it for Aeropress too (so fines are harder to identify). Thanks. My 15 year old Baratza Solis Maestro grinder is running on borrowed time. Issues with dark roasts (more oily) and down to 25% range on grind control. I may try to disassemble and clean again. Guessing need replacement grinder. (03-13-2018, 09:59 AM)SCOV Wrote: My 15 year old Baratza Solis Maestro grinder is running on borrowed time. Issues with dark roasts (more oily) and down to 25% range on grind control. I may try to disassemble and clean again. Guessing need replacement grinder. You probably need only a replacement burr. DIY replacement is easy (if you are comfortable with UN-press-friiting assemblies that are press-fitted, not screwed, together). Baratza is in the forefront of excellent customer service; give the fellows (or ladies) there a call. Thanks. I did contact customer service a few years ago and recommended one part to replace. When they say press fit, they mean "takes two for unpressing. I will ask Baratza again.